As one of the longest standing businesses in the town we have strong ties with the local Oldham community and work with many local charities, schools and not for profit organisations. Senior Partner, Vijay Srivastava is Chairman of Governors at Hulme Grammar Schools one of the area’s leading schools. For further details visit www.hulme-grammar.oldham.sch.uk. Vijay is an assessor for the Oldham Enterprise Fund (part of Oldham Enterprise Trust) which is a local easy to access fund aimed at supporting new and existing businesses based in Oldham. It offers the opportunity to bid for funding in the form of low cost loans and small grants but also delivers high quality free business support both before and after the application. Partner, Rachel Damianou Foundation Governor at St Anne’s Church in Lydgate, where she’s on the Parish Hall Management Committee. Associate Solicitor, Jyoti Patel, is a Trustee of Peshkar, an organisation that improves the lives of young people through the arts. We are thrilled to announce that our Partner John Porter has been made Chair of Governors of Oldham Sixth Form College. Rachel and Jyoti in our Trusts, Wills and Probate department are mentors for Career Ready students at Oldham College where they support students in growing confidence and enhancing their employability skills. We run free legal clinics in Saddleworth and Todmorden, you can simply drop in and speak to one of our team about any legal matter that is troubling you. We are members of the Dementia Action Alliance, an organisation across England committed to transforming the lives of people with dementia and their carers. Staff at our Oldham office left their suits at home and wearing their jeans on Jeans for Genes Day which takes place every year around September. We will each be making a donation of £2 in return for wearing jeans on the day. We’re delighted to have been part of the Manchester Airport Choir formed by The BBC and Gareth Malone OBE, for the 75th Anniversary Charity Concert. It was in aid of Medcare. Vijay’s wife, Praveena Srivastava, is also one of the choir members. For more information and details, please click here. Praveena Srivastava climbed Mam Tor in Derbyshire with work colleagues from the Dubai-based company DNATA. The climb was in aid of DNATAs project to build a school in Africa. 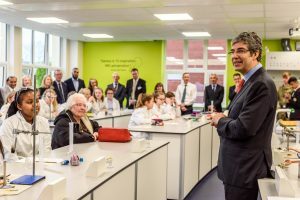 Senior Partner Vijay Srivastava was the driver of a project at Hulme Grammar School (where he is Chairman of Governors) that saw ‘old boy’, hero and the world’s leading war surgeon, David Nott, return to his old stomping ground to open the school’s new £500,000 science centre. Wrigley Claydon staff wore Christmas jumpers to work on Friday 15th December (national Christmas Jumper Day) and raised £126 for Action Oldham. This year, Wrigley Claydon staff sent £35 to the Alzheimer’s Society instead of sending Christmas cards to each one another in the office. World War One Memorial at Oldham Parish Church The Poppies knitted by Louise Davies, PA to Senior Partner Vijay Srivastava, covered the rails of Oldham Parish Church near the memorial. This Sunday marks 100 years since the end of the First World War. Dr Kershaw’s Will Week Next week we are participating in Dr Kershaw’s will week where in return for a donation to the hospice ( £100 for an individual, £150 for a couple) we will provide clients with a free will.